It was a rainy day and Becky and Vicky were lying in their dampen bed, in the corridor of an old shop. Their two sisters Rani and Soni were sleeping after drinking milk. Their mother Ruby had gone out in search of food. Before going out, she had told them not to leave their house until her return. She had promised them that she would take them out if there is no rain. They were just 5 days old and they had to be trained by their mother to save themselves from any danger. After some time the rain stopped. Becky and Vicky slowly came out of their house just to roam around. Rani and Soni were still sleeping and they didn't know Becky and Vicky were out, without following their mother's strict instruction. A young girl came there and slowly grabbed Vicky and Becky in her hands. Both of them were scared and began to cry, but the young girl told them not to worry and they will be safe with her. She gave them some milk and tried to console them, but they didn't stop crying. She packed them in a box and took them on her scooter to her house. When the scooter was moving fast they got more scared and began to cry louder, but slowly stopped crying. The young girl brought them to her house and provided them a good bed in a basket and gave them milk. Seeing the new place, both Vicky and Becky began to cry for their mother. Though they had a nice house and milk to drink they missed their mother and sisters. "Our mother must have returned home and she must be worried about us," said Becky. "We should have obeyed our mother and stayed at home. Now we won't be seeing our mother and sisters," said Vicky. When Mom Cat returned home she found two of her kittens missing. 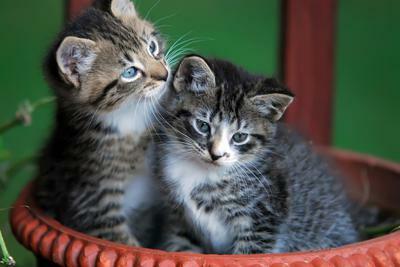 She asked her other kittens about Becky and Vicky. They didn't know anything about them. Mom cat was very upset. Where are my kids? What happened to them? Did anyone kill them? Or were they hurt in anyway? Did they eat anything? One day, the young girl brought Vicky and Becky to show their Mom cat and sisters. They told them they have been adopted by a good girl and they are very happy in her house. Mom cat was very glad to know the good news. After sometime, the young girl took them back from there and this time they didn't cry much. They lived happily in the young girl's house. Join in and write your own page! It's easy to do. How? Simply click here to return to Bedtime Stories .